Hi Dan- I just want you to know that I love my new software - Taste of Home and especially Cook'n Lite & Healthy. My husband and I have started Weight-watchers and I am finding the nutritional information very helpful. Also I can find many of my old favorites on this disc that are lighter versions!! Thanks again for making our lives easier, and healthier!! If you need healthy meals to replace the junk, then you need Betty Crocker's Best of Healthy & Hearty Cooking cookbook to provide you with healthy recipes. 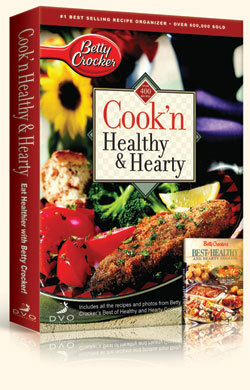 Our new Cook'n Healthy & Hearty CD comes with MOUTHWATERING photos and over 400 DELICIOUS HEALTHY RECIPES that your family will love. 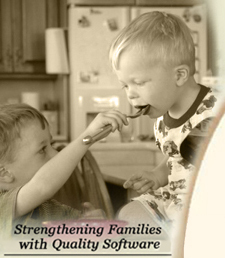 Leave it to Betty Crocker to put together a quality collection of healthy recipes that are both healthy and hearty. Every main dish is under 400 calories with 12 or fewer grams of fat. And the desserts are even better!